By any measure, Prince Harry's week long trip here, which has been dubbed in the media the 'Royal Image Rehab Tour,' was a rousing success. Much has been made of the fact that the last time Prince Harry visited the states in August of last year, he was caught with his pants down -- literally -- in Las Vegas having too much fun with some unidentified ladies. I say, give a prince a break. Unencumbered by burden having to worry about being the King of England some day, Harry lives a life most people envy. He's 28, rich and unmarried and has the world on a string. But he's no dilettante. For the past week, Prince Harry's visit here has shown the world that he is the perfect representative of the modern British monarchy. He just may emerge the most popular royal in the family. Engaged, empathetic, intelligent and by all acounts very approachable, he is, I bet, the royal most people, if asked, would most like to have a glass of champagne with. While much has been made of how much the Duke and Duchess of Cambridge (he is no longer to be called Prince William and Catherine was never officially 'Princess Catherine') do for Britain and how they have burnished the image of the British royal family, they seem far more scripted and while certainly very warm, hold themselves in reserve much more than Prince Harry. That's because, no doubt, the young couple will one day be the king and queen of England. There is no question the Duke and Duchess have done much to raise the stock of the monarchy, but there is just something about Harry that sets him apart. There has never been enough credit given to Prince Harry's more serious endeavors. Besides his charity work for The Royal Foundation (more on that later), Prince Harry is a captain in Britain's Army Air Corps and has served in Afghanistan twice. His first deployment ended after his whereabouts were reported in the media putting him and those he served with at risk from terrorist attacks. When he returned to Afghanistan, he was a copilot and gunner on a helicopter targeting the Taliban. When asked if he's ever killed someone in battle his matter of fact reply was: "Yeah, so, lots of people have." When you compare his life choices with those of our upper class (and the son of virtually any politician except Joe Biden; I'm sure there are others but its hardly a large group) it is a stunning contrast. Born into incredible wealth and privilege the grandson of the British monarch and the son of one of the most iconic women who ever lived, Prince Harry could surely have chosen a path of ceremonial duty and hid comfortably behind his title without incurring much criticism. After all, don't we (and I'm taking universally here) really prefer our princes to live out the fairy tale existences we've created for them. We know they're not like us so why have them pretend? Therein lies the difference with Prince Harry. He isn't pretending. He knows he lives a rarefied life and as he learned from his late mother, it is precisely because of that he feels he must give back and use his privilege and worldwide fame for good. During the past seven days, it was very much apparent just how well he has internalized the lessons learned from his late mother and his father. Honor and duty with the human touch is what Diana brought to the monarchy and is being carried on by both her sons today. After spending two days in Washington, DC with veterans and honoring the fallen at Arlington National Cemetery, the prince went to Colorado Springs over the weekend where he met wounded service members at the Warrior Games, the US military's paralympic competition for wounded vets. He sat on the gym floor with participants and was observed laughing and chatting with many different people. Again and again those who met him said, "He's very down to earth." When he came back east on Tuesday, he toured areas of New Jersey where Superstorm Sandy had badly damaged homes and businesses with Governor Chris Christie (who gave him one of his very own fleeces as a souvenir). There, he talked with residents and played carnival games with kids helping one elementary school aged girl win a Teddy bear. "He's really nice for a real prince," marveled the star struck child. Her sentiments were echoed by the adults that met him that day. "He didn't have to come here," one resident told me. "But because he did he brought the attention of the world here. That's something that means a lot to the people here." That same day, he went to Harlem where he visited a school with sports programs designed to help kids build self esteem. "Sport is something so important in helping children build confidence," he told the crowd. "I've always found so much satisfaction from participating in sports," said making a true connection with people whose lives bear no resemblance to his in any way. That night, Harry was the guest of honor at a fundraiser dinner at the Four Seasons Restaurant in New York City. It was the hottest ticket in town (and one of the most top secret) and every A-lister (and I mean every one of the glitterati) was trying to get in. Security was extra tight and the list was closed on Thursday although it was rumored a few tickets were still available and people were still clamoring to get in the day of the event. A mere $2500 got attendees a chance to meet Harry over cocktails. 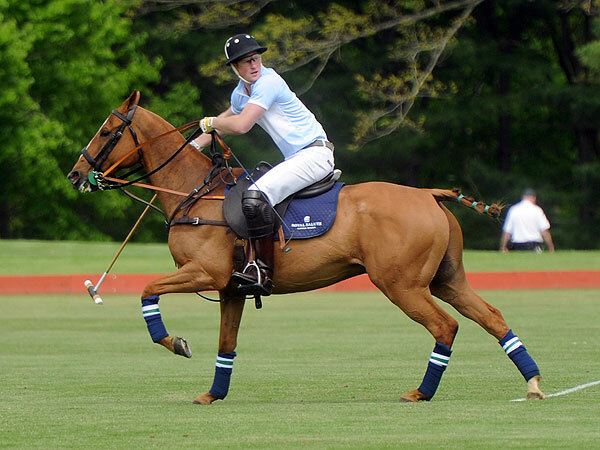 Those lucky enough to score an invite included Anne Hearst and Jay McInerney, Yankee Mark Teixeira and polo superstar Nacho Figueras. The press was not allowed inside the event. Then finally, this morning, all of Greenwich was abuzz with word of Harry's arrival. Shop owners on tony Greenwich Avenue that weren't included in the guest list of 400 for the by-invitation only luncheon and polo match to benefit Sentebale, a children's charity supported by The Royal Foundation, held British themed parties in their stores giddy at the thought that Harry was in town. Even the massive delays caused by street closures didn't dampen the enthusiasm surrounding the visit. Again, security was so tight that some guests coming to the Greenwich Polo Club got out of their cars and walked to the club's gates. The press was held behind a rope line. A huge number of photographers snapped photos while reporters chatted with celebrity attendees which included designers Valentino and Jason Wu, model Karolina Kurkova and Greenwich resident Gayle King. "It's a great honor to have the prince play polo here," said club founder Peter Brant. The event raised an estimated $1 million for charity. The guests, who dined on mini lobster rolls and a spring vegetable salad with English peas, didn't even notice the dreary rainy weather because all eyes were on the prince on the polo field. (No one was allowed to stamp down divots during half time because of security) The highlight of the match came when Harry scored the winning goal. His team won 4-3. "Thank you for a wonderful week," Prince Harry told the crowd. "I have seen the incredible generosity of the people of this great nation." And we witnessed the birth of the true superstar of the British royal family. Diana can rest easy. Her youngest son is a man who does her -- and his country -- very proud indeed.